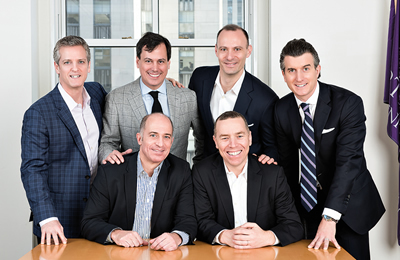 A few years ago, Stephan Hartman ’99 began to notice a peculiar fact: Kellogg grads working in finance often weren’t aware that their colleagues on Wall Street were fellow alumni. Hartman, who is currently head of business development at Houlihan Lokey, decided to bridge the gap by creating the Kellogg Finance Network (KFN), a community of alumni in New York City that is fostering connections and enhancing Kellogg’s brand in the global finance industry. The network offers a platform for alumni to build relationships, host educational events and provide industry feedback to the school and its faculty. Together with five fellow alumni, Hartman established a managing board to organize the network’s structure and start building the network. He reached out to Jerry Kenney ’67, a senior advisor at BlackRock, a leading asset management firm, to help recruit a group of alumni with 25 years of experience to sit on KFN’s advisory board. The network has organized a number of large-scale events each year, along with a series of monthly lunches where a Kellogg professor or board member will speak on a given financial topic. Kenney spoke about the impact of the regulatory squeeze on capital markets. Scott Shay ’80, Chairman of the Board at Signature Bank, led a discussion on Bitcoin and the future of exchange technology. Jeff Ubben ’87, founder and CEO of ValueAct Capital, an activist fund in San Francisco, spoke about recent industry trends. KFN also hosts receptions for Kellogg-affiliated organizations — for example, the Private Equity Group — and has even helped with recruiting. Several alumni recently met for dinner with a group of accepted students to talk about their Kellogg experience.